Author and documentarian Michael Moore brought his political commentary and humor to the University on Monday evening and criticized President Bush, the Republican and Democratic parties, as well as major corporations and media conglomerates. Moore is happy that approval ratings for Bush and the Iraq war have dipped but wishes the president and his administration would be removed from office and arrested for lying to the public about Iraq's alleged responsibility for Sept. 11 and the possession of weapons of mass destruction. "These people are serial liars, and it is incredible that they have gotten away with it for so long," Moore said before more than 1,700 people gathered in the Main Gym. "Once people find out the truth, they will respond." Moore's two-hour appearance was the most anticipated and popular event on campus in years. With tickets selling out weeks ago, Associated Students Performing Arts and Lectures, which sponsored the event, set up a live video feed in McKenna Theatre to help accommodate the large overflow crowd. While "angry white men" dominate Fox News Channel, MSNBC and talk radio, nearly two-thirds of voters in America are people of color or female, Moore said. He believes so-called conservative "angry white men" are 20 percent of the U.S. electorate, making them an endangered minority that is afraid it will soon no longer control the country's government and media. "The American public, when you say that word, the first image that should come into your head should not be one that looks like me. It should look like Oprah," he said. "You live in a liberal country and we need to start saying it and believing it because it's the truth," Moore said. "The only reason it doesn't look like that is because the liberal leaders have done anything but lead. All they've done is follow or try to be like Republicans." Moore praised Gen. Wesley Clark, a Democratic candidate for president in 2004, for his honest opinions but stopped short of an endorsement. The fact that Clark admitted he voted for Ronald Reagan for president should not deter Democrats from supporting him, Moore said. "If someone who voted for Reagan now says, 'I'm joining your team, I don't believe in that anymore,' we have to open up our arms," Moore said. "This is why people don't like the left. This is why people don't like liberals. … That's why nobody wants to join [the Democratic Party]. We're so on our high horse." A 49-year-old Flint, Mich., native who now lives in New York City, Moore is both revered and ostracized for his blunt, provocative and humorous opinions on political issues, world affairs and labor issues. He has directed three documentaries and one comedy film, created and starred in two television newsmagazine programs, and written four books. Moore's popularity has skyrocketed since his controversial condemnation this spring of Bush and the Iraq war during his Academy Award acceptance speech for his documentary "Bowling for Columbine." His latest book, "Dude, Where's My Country," debuted at No. 1 on The New York Times Bestseller list earlier this month. His nationwide tour, which is comprised mostly of college campuses, has sold out with thousands of additional ticket seekers at every venue. Moore said the California governor's recall election was the first time he had seen a Republican candidate lean to the left to get elected, although he did not support Arnold Schwarzenegger. "He had to be liberal on the social issues to get elected. Whether he was or not is beside the point," he said. 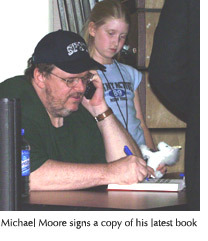 After the event, Moore signed copies of his books for the hundreds of people lined up. Senior Jovan Montantes, a 24-year-old psychology and business major, was the first in line for the event at 2:30 p.m. -- four and a half hours before the event was scheduled to begin. The avid Moore fan said it was worth the wait. "I love his views on the world," she said. "He speaks the truth from the heart. He is the last real voice preaching something different." Moore also spoke at UC Berkeley, UC Santa Cruz, and Sonoma State University during his trip to Northern California. He appears at University of the Pacific in Stockton on Wednesday and Portland State University on Thursday.